This 3-Ingredient Baked Brie recipe is my first ever 3-ingredient recipe on the blog - and possibly my favorite. Not only is it so simple - it looks impressive, like you spent hours preparing it instead of just 5 minutes. If you're looking something to bring to a friend's house for dinner or to make for your parents, this appetizer is sure to impress. The three ingredients are simple: start with brie cheese, top it with a delicious fruit jam (I used raspberry here), and wrap it up in store bought puff pastry. Pop it in the oven and in about a half hour, ooey gooey melted goodness is bubbling away underneath a buttery, flaky crust. So yeah, you should probably make this. Full disclosure: I ate this plain, with no serving or scooping mechanism other than a fork and knife. It's really unnecessary to even pretend you're not just trying to eat melted cheese straight. BUT if you're into that, serve this with your favorite cracker like Ritz. Make it a full on meal by adding it to a cheese and meat platter, maybe with some grapes - but know the baked brie will be the star of the show. 1-2 tablespoons of raspberry jam Substitute: Any kind of jam or jelly you want! Orange marmalade is another one of my favorites. 3. [Optional Step:] Brie cheese is encased with a white rind that keeps it fresh and soft inside. Chewing it is a little tough and it has a unique taste that is unpleasant to some. If you'd like, you can cut off this rind. I used a small paring knife to cut off the top layer of the rind pretty easily. See how to do this here. 4. Lay out the puff pastry flat on the counter. Place your brie in the middle of the dough. Spoon 1-2 tablespoons of your fruit jam or jelly over the top of the brie, adding more or less depending on your taste. 5. Wrap the pastry around the brie. 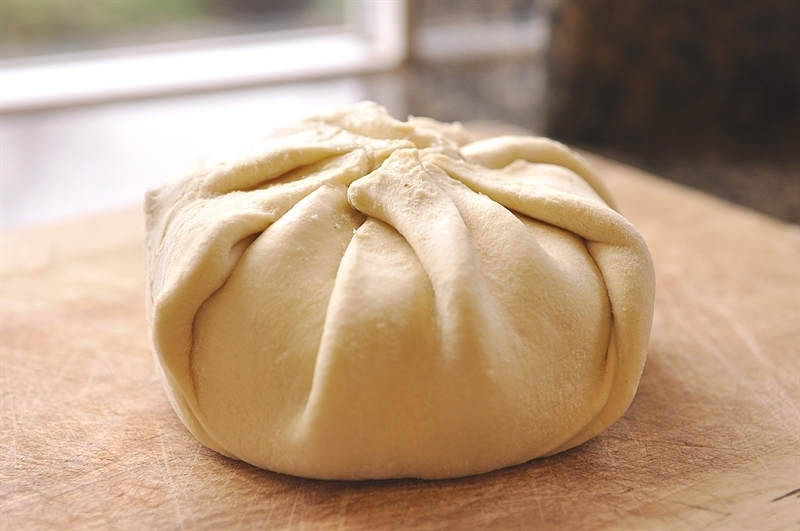 You should bring the edges of the pastry together so the brie is wrapped tight like a present. Kind of like this. You can't really go wrong here - just make sure there is no where for the brie to leak out towards the base of the cheese, and you'll be fine. I had a bit of excess pastry that I trimmed off, so if you end up in this situation, you can trim off any extra. 6. [Optional Step:] Brush the top of the brie with melted butter to get that beautiful golden brown look when it comes out of the oven. 7. Bake on 400°F for 30-35 minutes. Begin peeping at the brie after 25 minutes and see how it's holding up. It should be fully cooked (not raw and shiny), flaky, and slightly browned. It will likely take about 30 minutes to be fully cooked. STORING - This dish is best enjoyed warm in one sitting. I don't recommend you have any leftovers - chances are slim, anyways, because the melted goodness is irresistible. EXTRA INGREDIENTS - Unless you make a double batch, you'll have one extra sheet of puff pastry left. Use it to make mini apple pies or chicken pot pie, or check out Buzzfeed's 18 Easy and Inexpensive Desserts You Can Make with Puff Pastry. Or just more baked brie. The Superbowl is coming up (Here in Boston we're pretty excited about the Patriots!) and it's time to share one of my most popular recipes among friends: my Warm Cheddar Ale Dip recipe. Most of my friends who read this might not even recognize it by this name because to us, it's simply known as "beer cheese." Beer cheese is legendary and has gotten us through many fun nights. My beer cheese recipe has seen it all - spending the night in a cabin with two dozen friends became a tradition senior year of college, and I've hiked in beer cheese up a mountain or through a trail in the pitch black an absurd number of times. The first time, I made it beforehand and carried it still warm...uphill...in the dark. The next time I learned to make it when we got there but either way, the pot was always empty when we left. I'm excited to share it with you today because it is one of my more sentimental recipes, associated with s'mores and campfires and the great outdoors and also semi-formals when we'd have friends over beforehand (because why not eat gooey cheesy beer dip in a nice dress?). And, it's here just in time for an epic Superbowl party - because beer and football simply go together. The secret is using high quality ingredients since there are so few in the recipe in the first place - sharp Cabot Cheddar cheese, a solid ale (I went to college right along the border of VT and NH so I'm a fan of Switchback or a seasonal Harpoon option. Whatever you choose to dip in it (some have been known to eat it with a spoon), be sure it's high quality. I recommend a crusty baguette or loaf of fresh sourdough bread. Say hello to your biggest crowd pleaser. Depending on who you are (and who you're friends with), this can serve 8-10 people. It makes about 3 cups of beer cheese. Other Recipes With These Ingredients: Beer: You know what to do here // Cabot cheese: Grilled cheese. 2. Slice your bread/baguettes into slices or chunks for dipping. 3. Melt 3 tablespoons of butter in a large saucepan. 4. Whisk in the 3 tablespoons flour and 1 teaspoon ground mustard (if you're adding it). 5. Season with ground black pepper, if you'd like. 6. Once the flour & butter mixture starts to bubble, pour in 1 12-oz. bottle of beer and whisk for 1 minute. 7. Slowly add the 2-3 cups Cabot Cheddar cheese, whisking as you go. Add as much as you want until the dip is the consistency you want. 8. Let the dip heat through, whisking frequently, 3-5 minutes. 8. Serve warm with fresh sliced bread. EXTRA INGREDIENTS - Drink the beer. Make grilled cheese with the Cabot cheddar. The end.